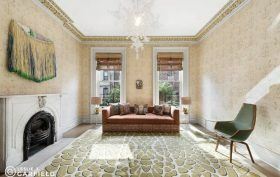 This Chelsea townhouse at 332 West 20th Street is being sold off by a power couple: Adriana Cisneros, the CEO of Grupo Cisneros, a Venezuelan media and entertainment company, and her husband Nicholas Griffin, a novelist. They bought the pad in 2004 for $4.005 million and have put it on the market for nearly double, $7.85 million. The single-family, four-bedroom townhouse is decked out with fireplaces and a modern kitchen, not to mention a wall of bookshelves that would impress any writer.